Ever since the Justice Department got a search warrant and seized documents from Trump's lawyer, Michael Cohen, Sean Hannity of Fox News has been railing about it. He has called it a government effort to destroy the attorney-client privilege in this country. It now turns out that he had a reason for attacking the seizure other than to protect Trump. It came out in court on Monday that Hannity is also one of Cohen's three clients in the last two years. 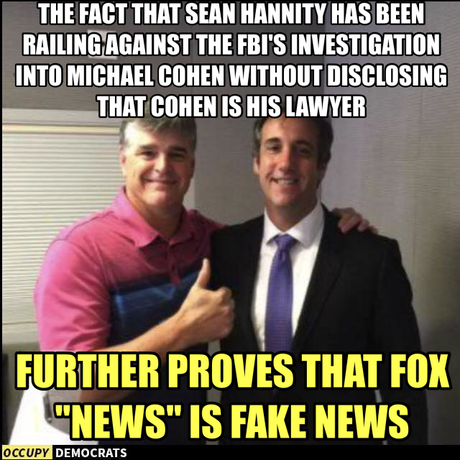 And Hannity didn't want that information know (and had asked Cohen to keep it secret). Of course, Hannity is trying to squirm out of it. But he wants to have his cake and eat it also. He is denying that he was a client while asking that his attorney-client privilege be respected. That's not going to fly. It just shows he has as little regard for the truth as he does for journalistic ethics. Some are calling for Hannity to be fired, and if Fox News was a real news organization that might make sense. But it's not. It's a right-wing propaganda organ, and it has shown that it doesn't have any more respect for truth or journalistic ethics than Hannity does. UPDATE -- MSNBC has revealed that Cohen is not the only Trump attorney that Hannity has dealt with. He has also used Jay Sekulow and Victoria Toensing, and had them on his show without revealing that. Hannity's ethical hole keeps getting deeper.